Sophie's Soapbox | Baroness Sophia the Orange collects online resources here for everything she's interested in… which is a lot. I’m working hard at created more healthy balance in my life. That means making time for more activities that feed my soul and heal my body. My health has deteriorated leading up to my 45th birthday this summer, so my time management must shift towards self care on all levels. Hence, careful selection of SCA events to attend. March 2019 and forward – TBD. KASF depends on where it’s held. If it’s not on this list, and it’s an SCA event, I won’t be there. I *am* looking for events to attend in the world of improvisational acting and Shakespeare experiences. These hobbies feed my soul and I need more of them. Posted in Life Management. Tagged balance, events, schedules. What is the Commedia All Stars troupe? 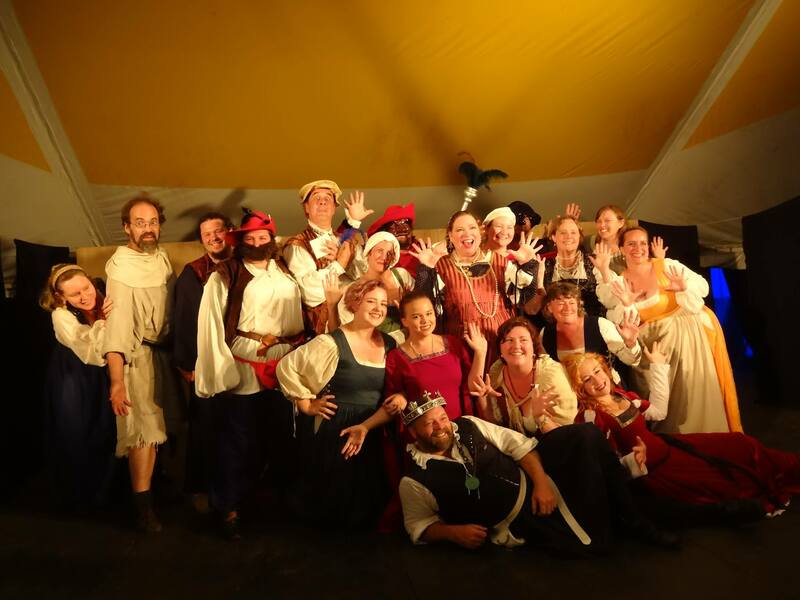 At Pennsic 43 (2014), I created the first production of the Commedia All Stars troupe at Pennsic. It was a significant experiment. My goal was to gather anyone who wanted to play commedia at Pennsic and produce a Commedia dell’ Arte play entirely *at* Pennsic. No rehearsal ahead of time. The goal was to see if we could do it. I did get a lot of help. We gathered 18 players from 4 different kingdoms and 7 different commedia troupes! The folks that created that first All Stars production were all gambling that it would be successful. We had no guarantee we’d be able to have fun as well as produce a high-quality commedia dell’ arte play. And it had to be funny. It’s no fun if the audience isn’t laughing. We did succeed! You can see the result on this You Tube video: https://youtu.be/sXf1abi2zok Watch until the end to see the long list of credits! As we have developed the All Stars program over the past 4 years, we have grown. All the participants in the All Stars troupe are also contributing to spreading commedia by teaching, running more commedia at home, or publishing written works on commedia. This group exists for more than just doing commedia for fun. We support the expansion of commedia by modeling excellence in commedia and helping others learn commedia too. The name “All Stars” has taken on additional meaning over the years. This troupe is not populated by the most talented, ranked, vetted, or perfected Commedia players in the world. This troupe is populated by the most teamwork-oriented players that can be gathered at Pennsic. Each one of the players in All Stars is a uniquely contributing member who also supports their fellow commedia players. They also take on the extra task of supporting commedia by teaching, running, or writing about commedia. They do more than just let the Capocomico take them on a ride of fun. They all pitch in, give back, and support each other. Each one of the All Stars players is a star in their own right but part of a team. There are no divas that float above the rest. Every single person’s contribution is part of a magnificent collaboration. That’s what makes this group All Stars. This year, 2018, I am stretching again and using online auditions to get a head start on seeing the players in action. We’re also going to have some online rehearsals using Zoom conference calls. This year’s scenario writing is underway with the magnificent Honorable Lady Luceta di Cosimo, and auditions will begin soon. This year, rehearsals will be carefully scheduled in order to allow players to also participate in the fencing activities during the day. (There is a mysterious connection between commedia and SCA rapier fighting that has yet to be understood.) We have a 3 hour block for rehearsals between 9:00am – 12:00noon. Each player will be expected to be there during 2 of those hours depending on their role. Some will be there from 9:00 – 11:00 and some will be there from 10:00 – 12:00. This is intended to reduce the amount of time each player is sitting around waiting for their turn to rehearse as well as allow more flexibility for players to participate in other Pennsic activities. The exact schedule will be determined after auditions and casting. Rehearsals are still a total of 6 Pennsic days: Middle Saturday through and including War Thursday. The show is War Thursday night, 9:30pm, at the Performing Arts Tent. This project could not be as much fun and as successful as it has been without the significant support of two amazing people: Luceta di Cosimo and Manus MacDhai. Luceta not only writes all our scenarios but she also has helped me research period commedia deeply and repeatedly. She’s incredible at helping me understand the sources we have to figure out what commedia was like in the 16th century. Manus is my beloved husband who has neglected his rose garden way too often to come play commedia with me. He is the Logistics & Technical Manager for our marriage and our commedia troupes. I couldn’t make commedia happen without him. So, I publicly thank Luceta and Manus for their unique and critical contributions to the All Stars troupe! Additional loving thanks go to members of the i Sebastiani troupe who have served as coaches for All Stars over the years: Master Anton of Winteroak, Mistress Rhonwen ap Glonwy, Master Frtiz, and Lord Harold Longfellow. Super huge thanks also to Duke Steffan Glaube of Lochac for priceless directing assistance! We have also benefited from classes taught by Lady Katrusha and Lord Tristan, so thanks to them too! A final thank you to the audiences that come to the All Stars shows at Pennsic! Without an audience, it would just be another rehearsal! Posted in Commedia. Tagged Commedia All Stars, Pennsic.